In a medium-size mixing bowl, mix the parsley and chile pepper with the tomatoes. Let sit for twenty minutes. Make the dressing by whisking the lemon juice, cayenne pepper, mustard, olive oil and salt together in a small bowl. Dress the tomatoes, toss, serve and enjoy! 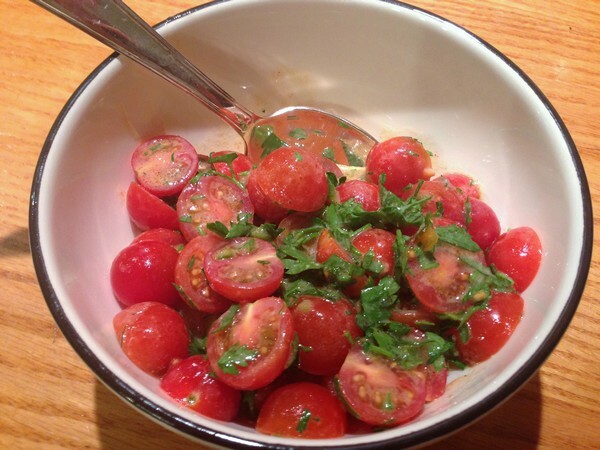 My verdict: I’ve made this salad a few times – it’s great when you have a plethora of cherry tomatoes. Frank thought this batch had a little too much mustard (and although it pains me to say so, he was probably right). Even if your tomatoes aren’t wonderful, the spice and lemon make up for less than stellar fruit. I recently served it with my favorite Indian chicken, as we were a little shy on vegetables that evening and I had a couple of boxes of cherry tomatoes. If you’re not a fan of spicy food, go easy on the Serrano and cayenne and add as much or as little as you’d like. Cilantro is a nice addition or replacement for the parsley and if you don’t have a freezer full of chilies (like I do), just add more cayenne.